Types of Epilepsy.Check which Type Do You Have? Epilepsy is the occurrence of sporadic electrical storms in the brain commonly called seizures. These storms cause behavioral manifestations (such as staring) or involuntary movements (such as grand mal seizures). There are several types of epilepsy, each with different causes, symptoms, and treatments. When making a diagnosis of epilepsy, your doctor may use one of the following terms: idiopathic, cryptogenic, symptomatic, generalized, focal, or partial. Idiopathic means there is no apparent cause. Cryptogenic means there is a likely cause, but it has not been identified. Symptomatic means that a cause has been identified. Generalized means that the seizures are involving the whole brain at once. Focal or partial means that the seizure starts from one area of the brain. In idiopathic generalized epilepsy, there is often, but not always, a family history of epilepsy. Idiopathic generalized epilepsy tends to appear during childhood or adolescence, although it may not be diagnosed until adulthood. In this type of epilepsy, no nervous system (brain or spinal cord) abnormalities, other than the seizures, can be identified on either an EEG or imaging studies ( MRI). The brain is structurally normal on a brain magnetic resonance imaging (MRI) scan, although special studies may show a scar or subtle change in the brain that may have been present since birth. People with idiopathic generalized epilepsy have normal intelligence and the results of the neurological exam and MRI are usually normal. The results of the electroencephalogram (EEG — a test which measures electrical impulses in the brain) may show epileptic discharges affecting a single area or multiple areas in the brain (so called generalized discharges). Idiopathic generalized epilepsy is usually treated with medications. Some people outgrow this condition and stop having seizures, as is the case with childhood absence epilepsy and a large number of patients with juvenile myoclonic epilepsy. Idiopathic partial epilepsy begins in childhood (between ages 5 and 8) and may be part of a family history. Also known as benign focal epilepsy of childhood (BFEC), this is considered one of the mildest types of epilepsy. It is almost always outgrown by puberty and is never diagnosed in adults. 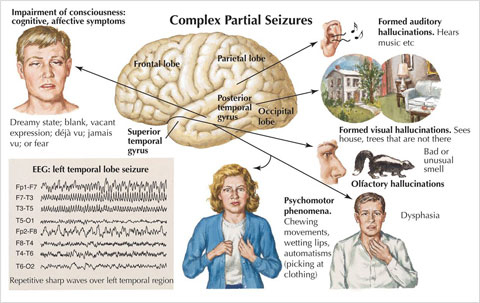 Seizures tend to occur during sleep and are most often simple partial motor seizures that involve the face and secondarily generalized (grand mal) seizures. This type of epilepsy is usually diagnosed with an EEG. Symptomatic generalized epilepsy is caused by widespread brain damage. Injury during birth is the most common cause of symptomatic generalized epilepsy. In addition to seizures, these patients often have other neurological problems, such as mental retardation or cerebral palsy. Specific, inherited brain diseases, such as adrenoleukodystrophy (ADL) or brain infections (such as meningitis and encephalitis) can also cause symptomatic generalized epilepsy. When the cause of symptomatic general epilepsy cannot be identified, the disorder may be referred to as cryptogenic epilepsy. These epilepsies include different subtypes — the most commonly known type is the Lennox-Gastaut syndrome. Symptomatic partial (or focal) epilepsy is the most common type of epilepsy that begins in adulthood, but it does occur frequently in children. This type of epilepsy is caused by a localized abnormality of the brain, which can result from strokes, tumors, trauma, congenital (present at birth) brain abnormality, scarring or “sclerosis” of brain tissue, cysts, or infections.Sometimes these brain abnormalities can be seen on MRI scans, but often they cannot be identified, despite repeated attempts, because they are microscopic.